The RGB encoder is a 24 indent encoder. You’ll feel 24 clicks when turning one 360 degree rotation. The encoder works best with the Clear Plastic Knob but is compatible with any knob with a 6mm knurled hole. The encoder output is filtered through a series of resistors, capacitors, and error checked in software to be sure the accurate number of ticks is being output. The encoder has an RGB LED built into it. To get the full light effect we recommend a clear knob but depending on your setup you may also be able to get a ‘backlit’ effect with an opaque knob. 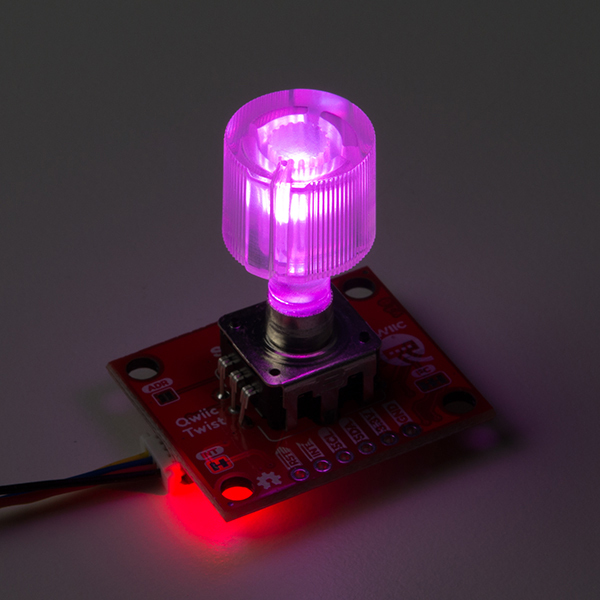 The RGB LEDs are pulse-width-modulated and controlled via software (and backed by non-volatile memory) so you can tell the Qwiic Twist to go to any color you want and it will be that color now and even after the Twist is power cycled (it remembers the last color setting). The encoder has a built-in momentary button. This is useful for selecting menu items and getting general feedback from the user. The Qwiic Twist is best used with the Qwiic system. Simply plug a Qwiic Cable into the Twist and start talking to it. Alternatively you can solder to the I2C pins on the board. Heads Up! 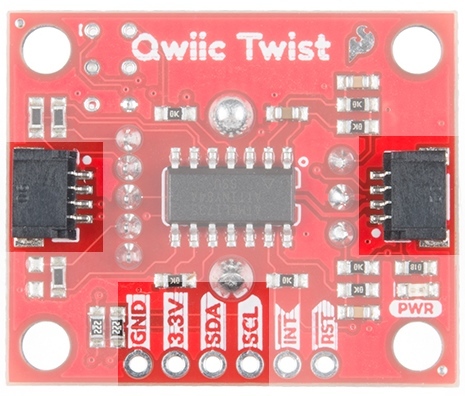 The Qwiic Twist is designed to operate at 3.3V so please don’t drive it at 5V. Your I2C pins, however, can be 5V logic. The reset pin is an active low input. When pulled low Qwiic Twist will be held in reset. The user presses the button is pressed or released. The user has turned the knob and no movement has been detected for a certain amount of time. This amount of time is called the turnInterruptTimeout and is 250ms by default. This means that once the user has stopped turning the knob for 250ms the interrupt will fire. This is helpful when the user is doing lots of knob changes. The Qwiic Twist won't fire the interrupt until the user has stopped fidgeting. The turnInterruptTimeout is software configurable from 1ms to 65000ms (65 seconds). The INT pin is open drain and is pulled up through a 10k resistor but if you want to connect multiple Twists and share the interrupt pins among many Twists then you can optionally cut the jumper to remove the 10k pull up on each Twist board. The ADR jumper is normally open and controls the I2C address of the device. 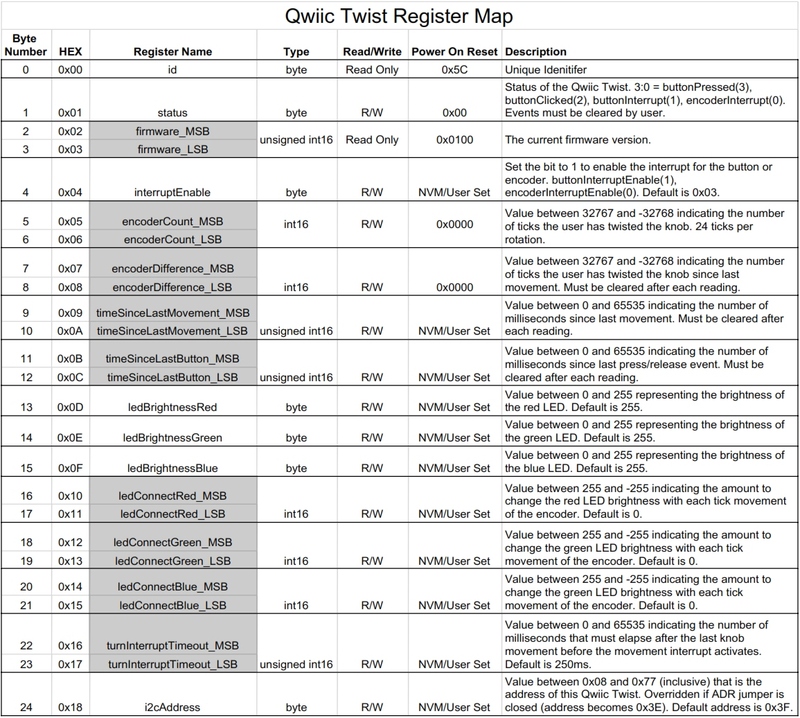 By default the Qwiic Twist 7-bit unshifted address is 0x3F. If the jumper is closed with solder, the address will become 0x3E. The Twist is unique in that it can have any address assigned to it between 0x08 and 0x77. This means over 100 Twists can be connected on a single bus! Note: If the ADR jumper is closed then Qwiic Twist will resort to address 0x3E regardless of what address may have been configured via software commands. This is a safety mechanism in case the Twist gets set to an unknown address. The INT jumper is a normally closed jumper; there is a small trace connecting the two pads. 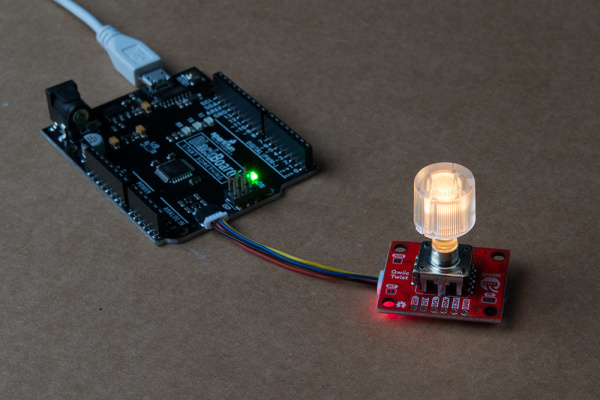 This jumper connects the INT pin on the ATtiny84 through a 10k resistor to 3.3V. Cutting the small trace disconnects the 10k resistor from the INT pin on the ATtiny84. 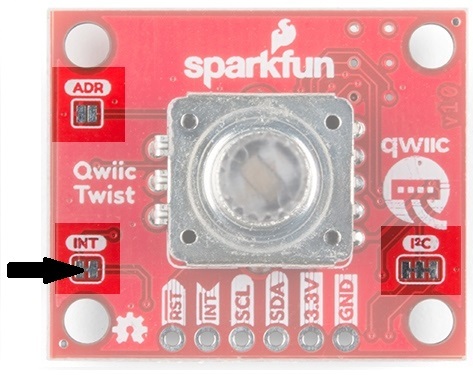 The INT pin on Qwiic Twist is open drain, meaning the pin will actively go low when an interrupt occurs but will then float when there is no interrupt. This open drain type of setup is handy if you have multiple devices sharing a single interrupt line. For advanced applications (such as many many Twists all sharing the same INT pin) you may want to cut this jumper on each Twist to remove the 10k pull ups. For general use you can leave this jumper unmodified. The Qwiic Twist has built-in 2.2k pull-up resistors on the SDA and SCL lines. These are needed for normal I2C communication. The I2C jumper has two small traces connecting the pull-ups to 3.3V. For general use you can leave this jumper unmodified. If you have many (over 7) devices on the I2C bus, each with their own pull up resistors, then you may want to cut the I2C jumpers to disconnect the 2.2k resistors on each Qwiic board. Below are the various functions that can be called from the library. Most of these functions are demonstrated in the examples so we recommend you go through each example first. int16_t getDiff(boolean clearValue = true); -- Returns the number of ticks since last check. Clears the difference once read. boolean isPressed(); -- Return true if button is currently pressed. boolean isClicked(); -- Returns true if a click event has occurred. Event flag is then reset. uint16_t timeSinceLastMovement(boolean clearValue = true); -- Returns the number of milliseconds since the last encoder movement. Clears value once read. uint16_t timeSinceLastPress(boolean clearValue = true); -- Returns the number of milliseconds since the last button event (press and release). Clears value once read. 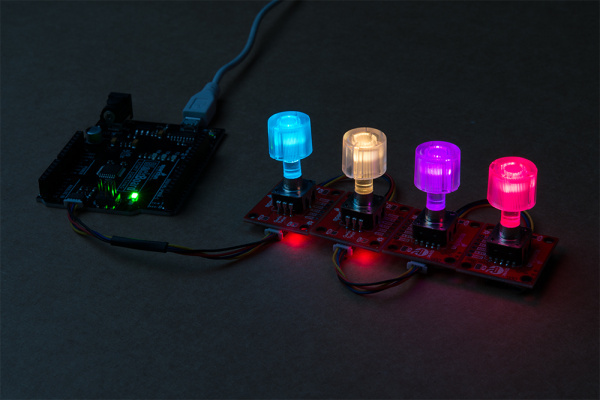 Color functions set the brightness of each LED. Connect functions set the relation between each color and the twisting of the knob. These functions connect the LED so it changes [amount] with each encoder tick without the master intervening. Negative numbers are allowed (so LED gets brighter the more you turn the encoder down). General functions get and set various aspects of the Twist. 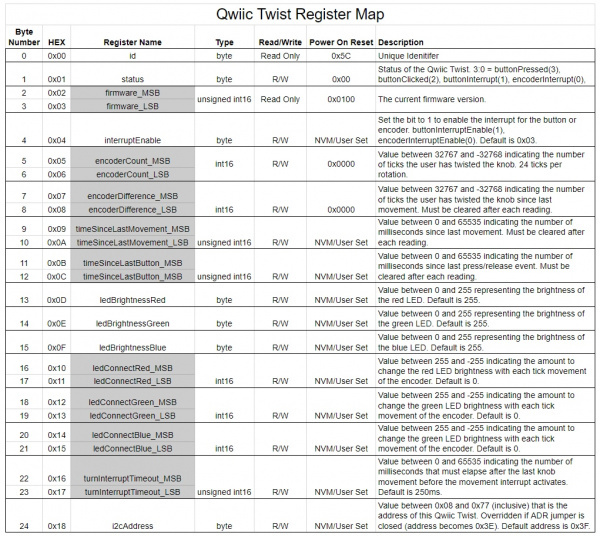 The Qwiic Twist behaves as a normal I2C slave. First write the address of the register you would like to read or write, then follow that I2C command with a Read to read the given register or a Write and a data byte to write to a register. The register address pointer is auto-incrementing so you can read and write multiple registers at a time. 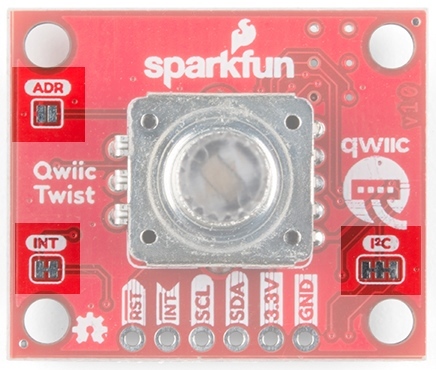 One of the more advanced (but really handy) features of Qwiic Twist is the ability to connect the color control to the knob movement. 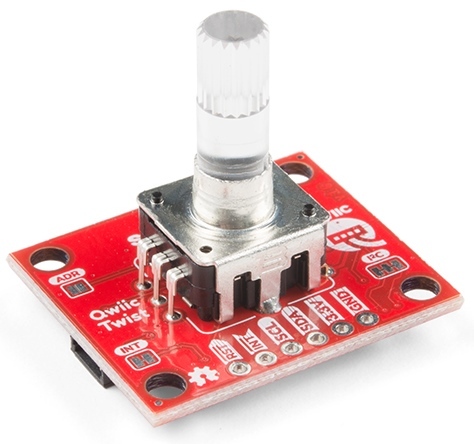 What this means is that you can have the red LED brightness increase or decrease as the user turns the knob without sending commands to the Qwiic Twist. 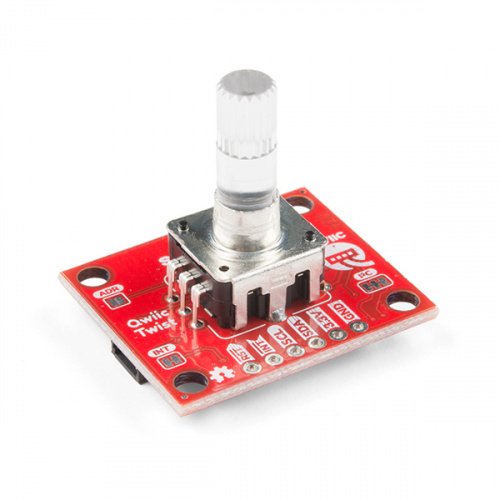 This greatly increases the responsiveness of the knob illumination and dramatically reduces I2C traffic. In the above photo we have connected blue to increase brightness by 10 for every tick increment, and connected red to -10 per tick. The color changes automatically without the need for intervention from the I2C master. The color connect values are stored in the Qwiic Twist and will be loaded after each power-on. See Example4 of the SparkFun library for a full demonstration. 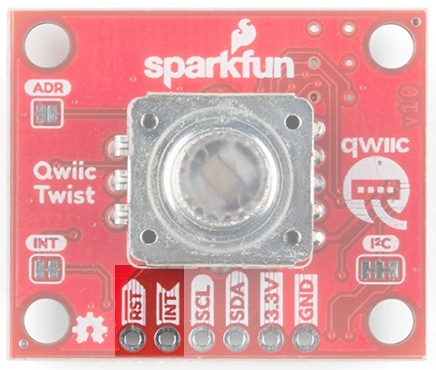 SparkFun Qwiic Twist Arduino Library - for easy interfacing to the Qwiic Twist including a litany of examples. This is most easily installed by searching the Arduino Library Manager for ‘SparkFun Twist’.